At historically black colleges and universities (HBCUs), halftime is game time. Students and fans flock to the stadium to witness the soulful stylings of the showtime band and the fierce dancers who accompany them. Their movements are sharp, explosive, and perfectly synchronized as they bring the music to life for the people in the stands. This is danceline, and its appeal extends beyond the stadium walls. The history of danceline is inextricably linked to HBCUs. "In 1947, HBCU bands decided to switch from the more traditional corporal marching-band style that you see at big schools to showtime band," says Kalé Woods, director of Heat Danceline in Oakland, CA, and assistant coach of Mahogany 'N Motion, the danceline team for Morehouse College. Showtime band maintains the precision-based element of marching band but adds an entertainment factor by incorporating some dancing by the band members themselves. "They basically brought the soul to marching band," Woods says. The change in music also brought about a change in style for the bands' dance teams. Over the years it became more and more stylized to match the music. The specific style varies from school to school, reflecting each school's culture. "I think of it in terms of geography," Woods says. For example, the Dancing Dolls of Southern University in Louisiana, coincidentally the first danceline dance team, have a style that's prim and proper. "They're like Southern ladies, with excellent technique and very little getting down or gyrating," she says. Schools in Mississippi and Florida incorporate a more hip-hop–based style. Mahogany 'N Motion, which is made up of dancers from Georgia's all-girls HBCU Spelman College, but dances for Morehouse College's football team, attracts studio dancers. "A lot of us come from the West Coast, which doesn't have any HBCUs and, therefore, is unfamiliar with danceline," Woods says. This difference is reflected in a more jazz-based style, incorporating lots of turns and leaps. If the style varies so widely, what unites danceline dance as a unique form? First and foremost, it's distinguished from both majorette dance and drill, two forms also linked to college bands. "People tend to associate majorette dance with baton and flag work, along with tumbling stunts," Woods says. "Drill is associated with ROTC and rhythmic military-like step." That said, there is quite a bit of crossover, and Woods' danceline team, Heat, competes in majorette competitions. While many dancers joining HBCU dancelines are studio-trained, the movement is very different from traditional competition dance. "Everything is hard-hitting, and nothing is soft or drawn out," says Jailynn Robinson, a freshman in Ebony Fire at Hampton University in Virginia. Before Ebony Fire's summer boot camp and audition process, Robinson had never encountered this form of movement. "I was a competition dancer, trained in ballet, jazz, and contemporary. I had taken a bit of hip hop, but this was completely new," she says. When people think of danceline, they likely think of the iconic formation with the captain in front of two to three lines of dancers. The captain "throws count" (also known as throwing cadence or calls): She performs an 8-count of movement, and then repeats that movement with the remainder of the team. Dancelines tend to perform these cadences in the stands, facing the field. 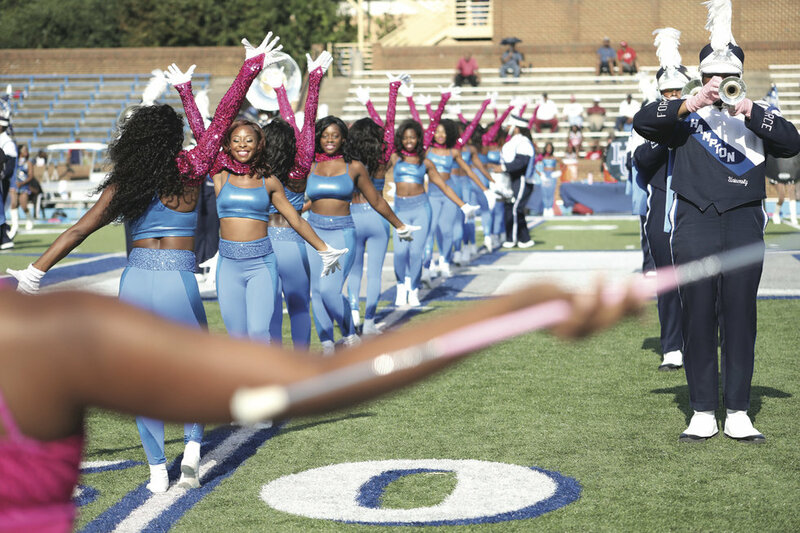 Another typical feature of the HBCU danceline is the stadium entrance, when they lead the band onto the field in single file. When Robinson arrived at campus the summer before her freshman year to attend band camp, she was all nerves. "I thought I was in pretty good dance shape, but I wasn't prepared for all the conditioning," she says. "It was a lot of running in the heat, but I quickly formed a bond with the other freshmen, and the rest of the team." After acing her audition, she earned not only a spot on the team, but also a fellowship of sisters who would come to shape her college experience. The girls of Ebony Fire spend a lot of time together, with three hours of practice Monday through Friday during football season, and additional hours of rehearsal on Friday nights and Sundays for special performances. Since the dancers need to build the stamina to dance throughout a three- to- four-hour football game, conditioning is a crucial part of practice. "We run three laps around the parking lot before stretching and beginning the rehearsal process," Robinson says. This training builds camaraderie, a spirit which continues into the team's collaborative choreographic process. "We're separated into groups and each group is assigned a section of the music to choreograph," she says. "The coach approves each section and makes corrections, and then we teach it to the rest of the team." Despite long hours of practice, the sisterhood extends beyond the stadium. "The girls I've met through the team are my best friends at school, and I know they'll be lifelong friends," she says. Woods' experience confirms the staying power of danceline sisterhood. "I'm connected with generations of Mahogany 'N Motion dancers—those who came before me and the girls currently on the team," Woods says. "It's a close bond, maybe even closer than a sorority. And it goes way beyond college." A version of this story appeared in the April 2019 issue of Dance Spirit with the title "The Danceline Dish."